There will come a time when you will need to take in additional information through your forms. Which especially holds true for theme authors and developers. For those situations, custom field data is what you will need to rely upon. 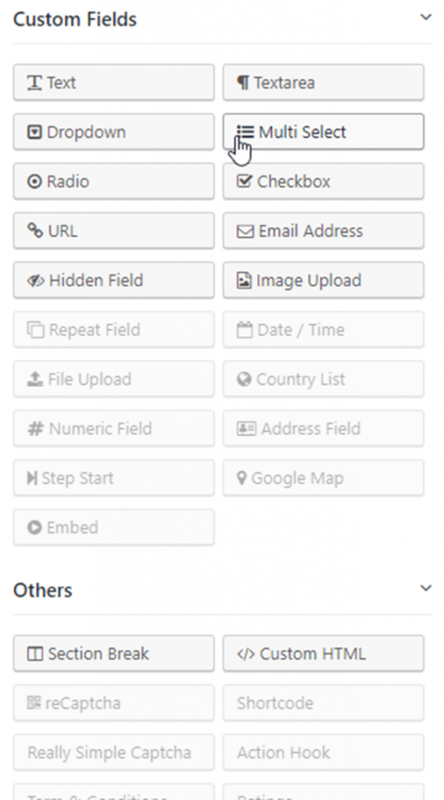 Custom field data is additional information that you can store as metadata to better understand the form submission data and the one who submitted it. It is extremely easy to execute in WordPress. And if you are using WP User Frontend Pro it is even easier. By default, WordPress comes with a built-in custom data section. As said before custom data are additional information of the users and the purpose of having those data depends on its use case. A great use case scenario for custom field data can be seen in the SEO plugin Yoast. While writing a post in the bottom section of your page you will see a separate section to add meta description and meta title. It is a perfect example of Custom field data usage. 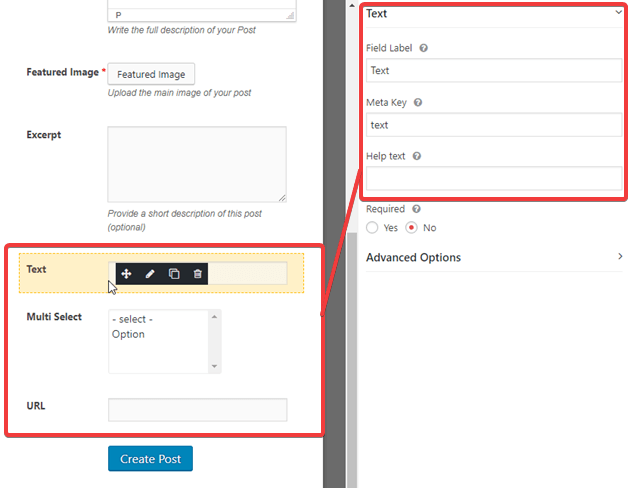 In the general settings menu of WP User Frontend Pro, you will find a checkbox to enable Custom Fields in the post that will show custom fields on post content area. Head over to that settings and click on the box of custom fields. The process will look like the diagram below. There you will find a simple checkbox to enable Custom Fields to show data. User submitted posts are not a new concept. Administrators often allow visitors or readers as guest bloggers in their sites. This opportunity makes the visitors engaged with the site more than ever. But visitors cannot come out of anywhere and post something to your site. There should be a process. Making a form for guest bloggers or users is the first step here. This is where comes the need of WP User Frontend. 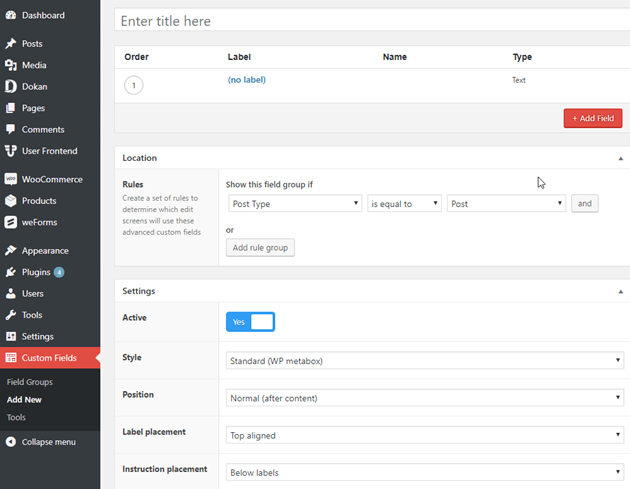 WP User Frontend lets you make a form for your guest users. In this form, you can add a number of facilities and options that you want your guest users to have. You can decide if they can post with user-submitted forms directly or they have to wait for your approval. To fix the facilities for your users you need to work with custom fields. 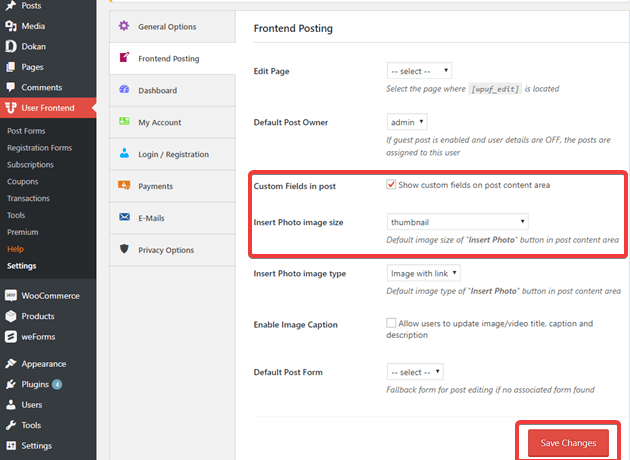 There are ways you can work on custom fields for user-submitted posts. Let's have a look at those. But before that do note that advanced custom field feature is a Pro feature of WP User Frontend. You will be needing to get the pro version from the pricing page of WP User Frontend. 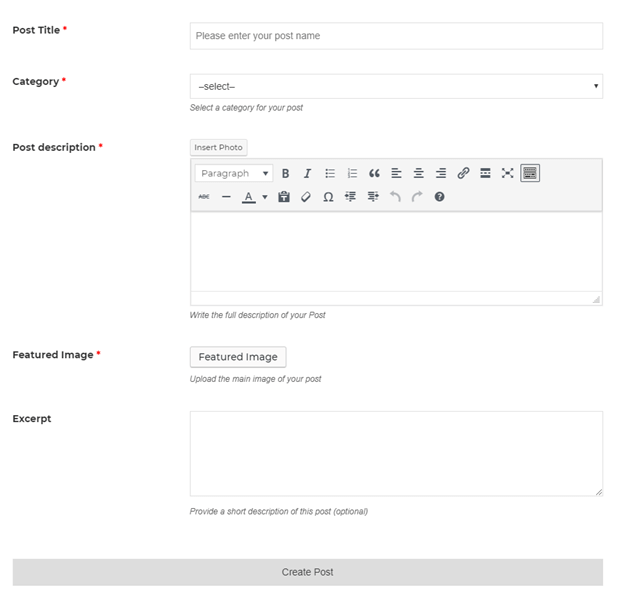 Creating a submit post form using WP User Frontend is easy. You already have some pre-designed templates for that. You get to set options for frontend posting, limit dashboard settings of your user, manage account and billing system settings and so on. 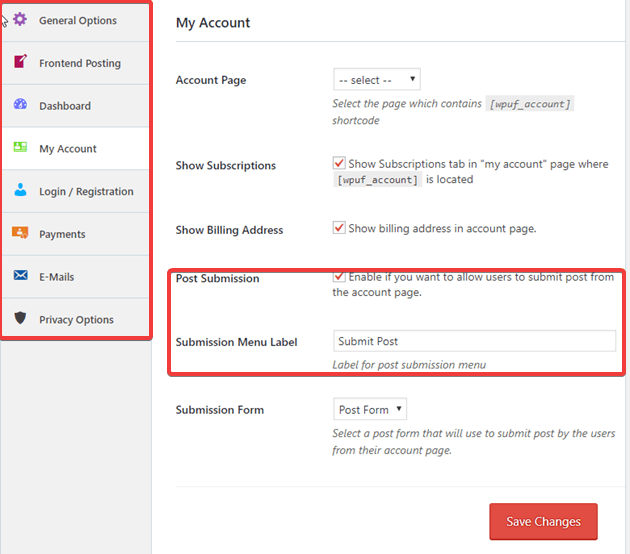 Once you are done configuring post submission form, firstly open a form and have a look at the options you have available there for custom fields. Remember how to activate the custom field option? 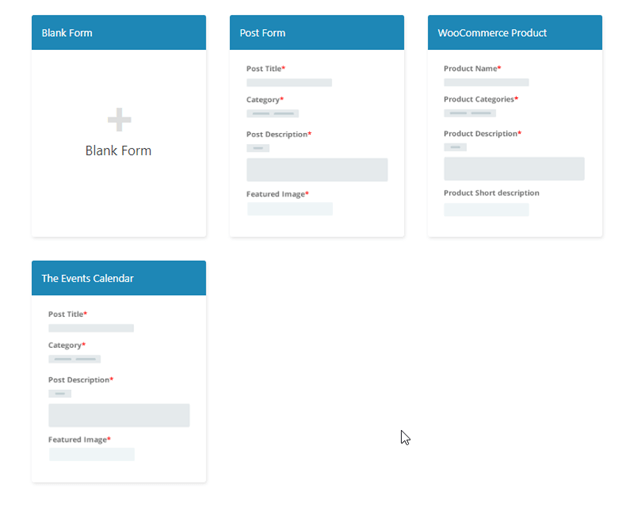 Now you can design the form exactly the way you imagined. There are individual settings for each field type that will give you the freedom to enable settings exactly the way you want it as an administrator. Also, you can either click on the options from the right side or you can simply drag the section you want and drop it in the form section. Simply add those fields in your form that you consider useful for your use case. You can edit each section individually just by taking the cursor on it and it will show you options for edit. For example, take this “Text” option. Take the cursor on it and it will show what things you can edit about the Text portion. If you click on edit a tab will be opened on the right side. You can add Field Label, Meta Key and a Help Text from there. Again, advanced options on the right side it will show you all the other functionalities that you can add and edit. You can control your features position, add the same feature twice, edit, or you can delete it as we have shown before. When you are done simply save the form. Then, clicking on the preview option on the top right corner will take you to the frontend. You will be able to see how the form will look like to the users through this Preview option. But you should always remember to copy the shortcode that is provided on the left corner above the post form. Now the guest bloggers often face a problem while writing that they cannot edit their mistakes as the settings do not allow them. For those bloggers, ACF came as a blessing. ACF is another plugin for WordPress. This lets guest users edit their content however they want it. 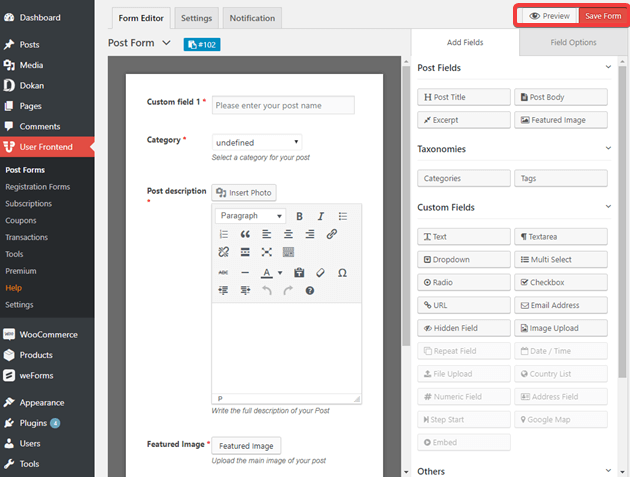 Again this is a WP User Frontend Pro compatible plugin integration feature. WP User Frontend Pro and ACF can work together and make blogging easier for guest users. You have to install ACF the same way you install a plugin. While activating ACF they will give you three options of Compatible, Migrate and No thanks. You can choose the one that is needed for you. But compatible and migrate is the flexible option here. 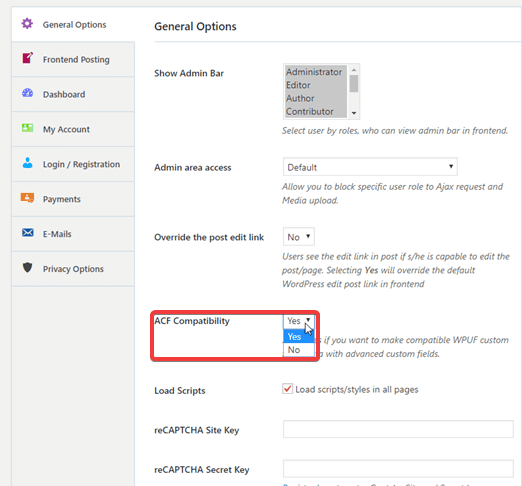 Once you activate ACF you have to go back to your WP User Frontend Pro settings and allow it to integrate with ACF. You can add fields that you like to have in your user submission form from ACF. You will have to go to the Custom fields of your dashboard and click on Add New. This will bring you to a page where multiple options are available. Click on the “Add Field” option on the right side and update. The fields will get integrated with your form. 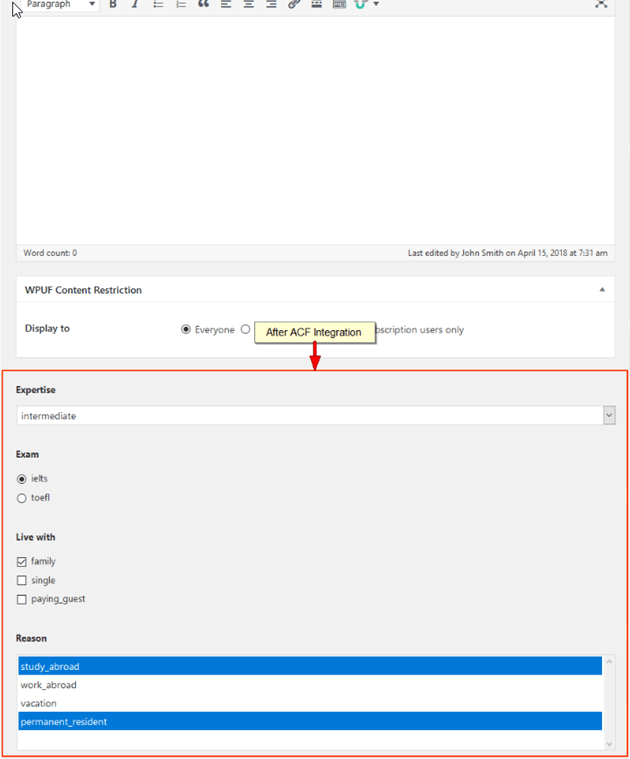 This is how your post will look like when you choose the migrate and compatibility option of ACF for your user submitted post with WP User Frontend Pro. 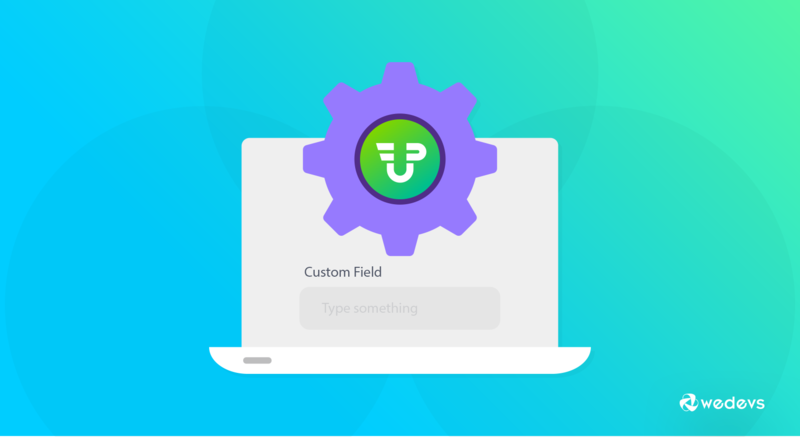 Hope this article answers your questions about custom fields and how they are important in user-submitted posts. In addition, we tried to help you with another way of making your guest blogging easier. Keep blogging and let us know how helpful it had been. If you are still not a user of WP User Frontend or you have just recently started using the free version of WP User Frontend, then you can..